Jay and Nia are the children of two worlds, and as they'll discover, they can enjoy the best of both. From Mommy's jazz beats to Daddy's classical piano, we will dance with the twins through a book that explores what it is to be of mixed ancestry, proving that a child is more than the sum of their parents. 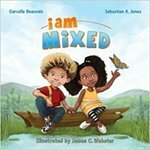 Beauvais, Garcelle and Jones, Sebastian A., "I Am Mixed (I Am Book)" (2012). DIVerse Families. 402.